The Roland GX-24 vinyl cutter/plotter offers enhanced speed, performance, reliability, precision and handling. Design all sorts of graphics from: decals, stickers, labels, signage, stencils, to even pin striping, vehicle graphics and window tint. The Roland GX-24 is the ultimate for print-and-cut jobs with its built-in optical registration system that accurately aligns pre-printed material for contour cutting. The Roland GX-24 comes with everything you need to create professional-grade graphics and signs right on your desktop. For a more complete solution, purchase the additional cutter stand and cutter basket. In addition, Roland GX-24 vinyl cutter/plotter also comes with bundled Cut Studio design software FREE of charge. The Roland GX-24 is your all-in-one solution for all your vinyl applications and desires. There is no other vinyl cutter/plotter on the market that offers the versatility and reliability offered by Roland GX-24. The Roland CAMM-1 Servo GX-24 uses a digital servomotor to achieve maximum accuracy and cutting speeds up to 20in. per second. The precise cutting at high speeds is a direct result of a built-in curve smoothing function. This is where other vinyl cutters/plotters don�t measure up. Blade offset values can also be adjusted manually for optimum results on a wide range of materials. An optional small-lettering blade produces sharp, hi-quality results for small and intricate designs. The result is faster production and graphics so crisp; they resemble those of a professional. The Roland GX-24 also includes a feature that makes it stand out amongst other vinyl cutters/plotters. The Roland GX-24 vinyl cutter/plotter comes equip with an optical registration system that automatically recognizes printer crop marks to create a powerful and cost effective print and cut solution. The ability to mate an existing printer with the Roland GX-24 vinyl cutter/plotter opens the doors to an endless amount of new opportunities. Use your existing printer to create professional graphics, load them into the Roland GX-24 for a professional contour cut, and begin creating vehicle graphics, heat transfers for garments, and POP displays. From 2in. to 27.5in. 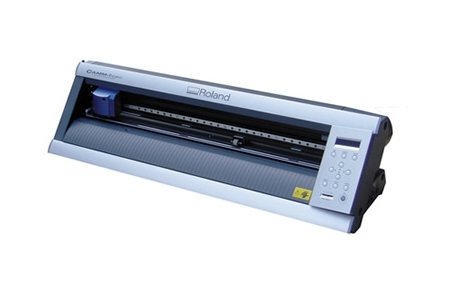 wide, the Roland GX-24 vinyl cutter/plotter accepts a wide range of materials. Cut various materials from vinyl, reflective vinyl, paint mask, twill, heat transfer and sandblast material, to even window tint. Contour cut pre-printed thermal transfers, ideal for printing on dark clothing. Cut intricate vehicle graphics for custom vehicle designs or contour cut pre-printed labels. With Roland Film Design software, you can even cut window tint film to match almost all vehicle window dimensions on the market. With the Roland GX-24 vinyl cutter/plotter, the possibilities are endless. Roland GX-24 vinyl cutter/plotter wins over even vinyl cutting rookies in seconds. Simply connect the Roland GX-24 through the USB interface to your computer, pan through features and functions on the easy-to-read LCD screen, and use the included Roland Cut Studio software to create incredible graphics for banners, vehicles, store displays, signs, backlit displays, and much more. The Roland GX-24 control panel even has a blade groove on its apron for easy manual cutting. 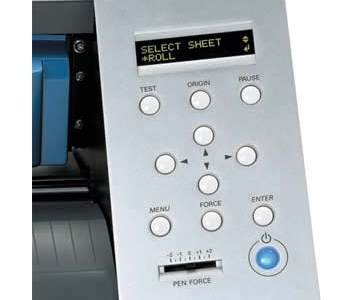 There�s even a sheet roller base included with every GX-24 vinyl cutter/plotter to keep media feed straight. The Roland GX-24 vinyl cutter/plotter is the perfect solution for the novice engraver. Roland GX-24 vinyl cutter/plotter ships with Roland Cut Studio design software at no additional charge. With Roland Cut Studio, you can enlarge, reduce, rotate, mirror and re-position images. Cut Studio also cuts enlarged images as crisp as the original size ones. The included software cuts TrueType fonts without outlining and creates overlays by selecting individual colors for cutting. Roland GX-24 supports BMP, JPG, STX, AI and EPS file formats and is compatible with Windows 98 SE/ME/2000/XP. 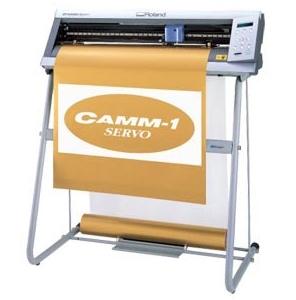 In addition, the Roland GX-24 vinyl cutter/plotter works with all professional sign making software. As well as a Windows printer driver, Roland GX-24 bundles plug-ins for Adobe Illustrator 9/10/CS, Corel Draw 10/11/12 for Windows, and Adobe Illustrator 9/10/CS for Mac. Also available is; Roland Film Design, a revolutionary design software that has made a tremendous impact on the auto tinting business. Loaded with powerful design features, Roland Film Design can be used with any brand of vehicle tint film and offers access to over 2,000 different window film pattern kits covering more than 1,000 different vehicles. The combined price of this FREE bundled software easily amounts to the cost of the Roland GX-24 vinyl cutter/plotter all together. Roland cutters have earned a worldwide reputation for reliable performance and outstanding results. Like all Roland products, they come with an international ISO certification. This signals Roland�s commitment to offering top quality products backed up with first-rate customer service and a wide variety of supplies and accessories.